So we all know that Meghan Trainor is “all about that bass,” but did you know there are some great reasons to strengthen your booty than doing it just for the looks!? The scoop behind your behind: You have probably heard of your gluteus maximus, but there are also quite a few more muscles that make up your “behind.” These include: gluteus medius, gluteus minimus, piriformis, superior gemellus, obturator internus, inferior gemellus, and quadratus femoris. I can be the first to tell you that the gluteus maximus is a huge part of this – I mean that guy is THICK (per a cadaver I cut up a few years ago…). 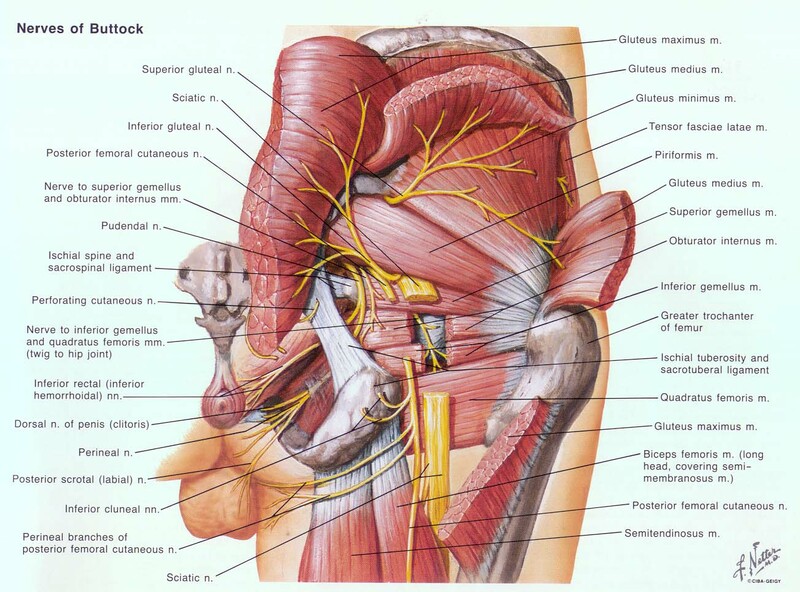 Here’s a picture to show just exactly how complicated the gluteal region looks. Pretty crazy and amazing, huh? So what can strengthening this gluteal region do for you? Here are a few exercises that target your glutes and are KEY in strengthening your gluteus maximus and gluteus medius specifically. All of these can be done at home ON YOUR FLOOR without any need to go to the gym. AKA NO EXCUSES!! I even did them in my bedroom (don’t mind my closet) just to show you! This exercise can be done a few different ways; however, this is one variation. By keeping your leg out straight, the bent leg is required to perform hip extension, causing the gluteus maximus to fire. Additionally, you are gaining some rotational core stability since you should stay with your hips level at all times, fighting the urge to drop the leg that is sticking straight out! Since these can be kind of awkward, I definitely try to refrain from doing them at the gym. That being said, this is great at targeting your gluteus medius while inhibiting the TFL muscle (located on the front/side of the hip as well) and causing irritation to the IT band (which tends to then cause many problems). Try to go as high as you can and as slow as you can, keeping your belly button tucked in towards your spine at all times. This simple pulsing exercise targets your gluteus maximus. By keeping the knee bent, you are making your hamstring muscle actively insufficient. What this means is that it is too short and already contracted, by the knee bending, that it is unable to assist in hip extension as much as it normally would. Taking out the hamstrings leaves us with all that leg weight resting on the gluteus maximus and making it work! Fire Hydrants (with additional extension). I prefer to do these with the hip extension as an added bonus (YAY). You are firing your gluteus medius as you abduct your hip out and up to the side, then firing your gluteus maximus as you kick back! Really make sure to focus on squeezing the glutes during this activity so that your hamstrings don’t take over. As always, if you feel you have sustained an injury or have any concerns, see a physical therapist near you to get properly evaluated so that you can return to your sport/activity safely! “Wow, I really regret that workout.” – said no one ever. (1) Powers, C. M. (2010). The influence of abnormal hip mechanics on knee injury: a biomechanical perspective. journal of orthopaedic & sports physical therapy,40(2), 42-51. (2) Souza, R. B., & Powers, C. M. (2009). Differences in hip kinematics, muscle strength, and muscle activation between subjects with and without patellofemoral pain. journal of orthopaedic & sports physical therapy, 39(1), 12-19. (3) Fredericson, M., Cookingham, C. L., Chaudhari, A. M., Dowdell, B. C., Oestreicher, N., & Sahrmann, S. A. (2000). Hip abductor weakness in distance runners with iliotibial band syndrome. Clinical Journal of Sport Medicine, 10(3), 169-175.